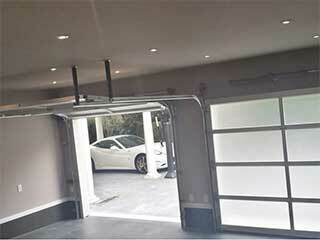 To the untrained eye, a garage door may look and function fine. But all it takes is something as simple as a slight misalignment of the tracks for problems to start. If the door fails to close all the way, hot and cold air can escape and cause an increase in your energy bills. Plus, just a one-inch gap between the door and the ground could make it easier for pests or intruders to enter your home. One of the main aspects of our maintenance service is your garage door springs. Over time, these powerful metal coils can develop hairline fractures from the constant wear and tear of opening and closing your garage door every day. These fractures are, of course, invisible to the naked eye. What can be visible to observe are deformations of the coils, which will be a clear sign that the springs are getting ready to break. When a spring snaps, the effects can be dramatic, and they can cause substantial damage to any property stored nearby, not to mention the risk to you and your family. Our qualified technicians will examine them for signs of weakness, lubricate them to keep their performance efficient, and make sure their tension is properly adjusted. We'll also check all the other aspects of your door, including the functionality of the opener. We'll make sure the safety sensors that prevent it from closing the door while there's an obstacle in its way are properly aligned and that their lenses aren't blocked by something or scratched. This will make sure that the system stays safe to use. Did you know that regular maintenance can extend the lifespan of your garage door by several years? This involves more than just an occasional drop of oil. It takes a good eye, experience, and a lot of knowledge to spot potential weaknesses and faults. Our dedicated maintenance specialists at Garage Door Broken Spring Orlando are experts at what they do. Why not let them do it for you? Call today and let us take care of your system.